At Byfield Auto, we've been providing professional automotive repair and service for Byfield and the surrounding area since 1986. We are a family owned and operated automotive repair shop providing top notch car and truck service at a family friendly price. Our expert repair technicians are trained to perform diagnostic and repair services on all makes and models, whether its a brand new car fresh off the lot, or that carefully maintained classic you keep safe in the garage except for summer weekend drives. We can take care of your factory recommended maintenance service as well. Our technicians keep up with the latest technologies, taking advantage of training classes and seminars to stay abreast of the latest diagnostic and service practices required by modern vehicles. Whether it's a simple oil and filter change, suspension repair, alignment, engine service, or just a simple light bulb replacement, we would be happy to provide you fast and friendly service. Byfield Auto's service staff can perform just about any service or repair that your vehicle might need. Below is a list of some of the services we offer. Even if it's not listed, we probably do it, so give us a call for an estimate. One of the most effective ways to help protect the life of your vehicle, especially its engine, is to regularly change the oil and oil filter. Your engine's oil reduces friction, minimizes wear, provides lubrication, forms a seal between the piston rings and cylinder walls, all while helping to cool engine parts. Engine oil breaks down over time, and if not changed carbon and varnish buildup can be harmful to your engine. We offer oil change service using traditional engine oil or longer lasting higer performing synthetic oils. Car overheating can come from several different sources. With engine combustion temperatures reaching 2000°F and higher, you want to be sure you cooling system is functioning properly. If your engine is running hotter than normal, or if you find coolant (antifreeze) puddled beneath your car, it's probably time to have your radiator and cooling system inspected. We can perform a coolant replacement service, including coolant system flush and help avoid engine overheating which can lead to costly repairs. And - it can help keep you from being stuck on the side of the road. 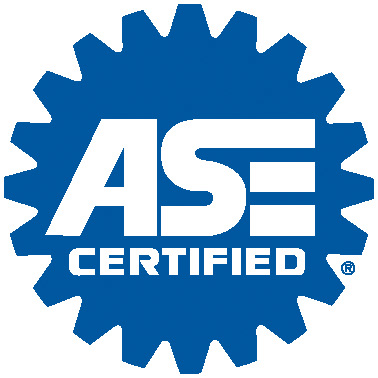 As we are performing any service or other routine maintenance on your vehicle, we always check for any other issues that might be effecting your car, truck, or motorcycle. Here we've listed some of the questions that come up most often. My owners's manual says I should use 5W-30 oil in my engine. Can I use 10W-30 or 10W-40 instead? Many vehicle manufacturers recommend a lighter weight oil be used in newer cars because newer engines are built to tighter tolerances than before. This requires a lighter weight oil for proper lubrication when the engine is cold. Lighter weight oil also helps to improve fuel economy. Most manufacturers will list a range of oils that can be used for different conditions, such as temperatures below 30°C, temperatures above 40°C, or while towing. These weight ranges will be listed in your owner's manual. Should I be using synthetic or conventional oil? Synthetic oil helps promote longer life and better performance in most vehicles. It bonds to engine parts providing a layer of protection that surpasses the protection afforded by conventional oil. Synthetic oil will also continue to pump through your engine when conventional oil would start to thicken in cold temperatures or break down from heat. Synthetic oil is recommended particularly for vehicles that are driven in cold climates – it will help you start your engine even when the temperature drops to -40°C. It is also good for high stress situations, such as pulling and towing. Remember, you can always switch back to conventional oil after using synthetic oil. Why is synthetic motor oil more expensive than regular motor oil? Synthetic oils are man-made in a chemical plant and cost more to produce. They provide better protection at extreme temperatures than regular or conventional motor oils. Conventional oils are mineral-based and come from crude oil that is removed from the ground and run through a refinery. While synthetics can improve engine performance, they don't eliminate the need for regular oil changes. Synthetics can handle the heat longer than regular oil but additives only work for so long and the engine will still contaminate the oil. What happens to the used oil from my car? 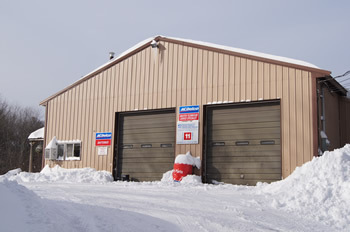 Byfield Auto recycles all used oil and other fluids. Some is used to fire the shop furnace, helping to keep our heating costs at a minimum. Any fluids we can't use directly are sent to a reclamation facility where it is processed for use in other applications. How often should my fuel filter be changed? During the hot summer months, contaminants such as pollen, dust, mould spores and smog can easily enter a vehicle's passenger compartment through the air conditioning, heating and ventilation systems. This can make the air in the car up to six times dirtier than the air outside. Cabin air filters clean the incoming air and remove allergens. You can protect yourself and your passengers from contaminants by replacing the vehicle's cabin air filter annually or whenever heating or cooling efficiency is reduced. In areas with heavy contaminants it may require changing more often. If your vehicle’s model is from 2000 or newer, there's a good chance it is equipped with a cabin air filter. Check your owner's manual for more information. When I stop quickly, my brakes vibrate or pulsate. Is something wrong? If you have anti-lock brakes, then no, there’s nothing wrong, this is what an anti-lock braking system (ABS) does. When you brake hard in a car without ABS, you will often lock up one or more wheels depending on the speed, road conditions, etc. This wheel lock-up results over longer stopping distances. On a car without ABS you should manually pump the brakes to prevent wheel lockup. On a car with ABS, the computer keeps your brakes from locking up. Your foot should remain firmly on the brake pedal, which allows the system to automatically pump the brakes. This on and off pressure to the wheels is felt in the brake pedal as a vibration or pulsation. How often should I have my brakes serviced or changed? Depending on driving habits, most cars need a brake service between every 25,000-30,000 miles. However, this is merely a guide. Both parts and labor costs can rise dramatically if, for instance, the braking system needs an overhaul. It’s always good practice to consult your owner’s manual, but disc pads need to be checked regularly. How do I find out if there is a recall or service bulletin for my vehicle? Contact the dealer or manufacturer of your vehicle. To determine if your vehicle was involved in a recall and has not been corrected, you should contact the manufacturer and provide the vehicle's make, model, year, and Vehicle ID Number (VIN). My check engine light is on. How do I know what's wrong? When the Check Engine light comes on, your car's computer system is letting you know it has detected a problem found by one of its sensors. You should have the car checked at the earliest possible opportunity. How can I prevent my car from rusting? A major cause of vehicle rust is the salt that is used on winter roads. To minimize rusting, have your vehicle undercoated. Byfield Auto is now offering undercoating services - contact us for details. Also, be sure to wash your vehicle on a regular basis whenever the temperatures allow, or at the very least when the spring thaw starts. Washing should include an undercarriage rinse (available at most car washes) to remove salt from hard-to-reach areas that are likely to rust such as inside the wheel wells. If you’re washing your vehicle at home, be sure to spray the hose under the car and around the wheel wells. My car isn't starting or running as well as it used to, and I'm getting reduced fuel economy. Does this indicate a problem? It could be that your fuel system isn't as clean as it should be. Byfield Auto offers a fuel system cleaning service that cleans and conditions your fuel injectors, intake valves, combustion chambers and exhaust emissions by removing harmful deposits and moisture. This can help reduce hesitation and sluggishness, as well as improve fuel economy. Radiator coolant, or anti-freeze, works to combat both heat and cold. This helps to ensure your engine doesn't freeze or over-heat. Over time and with exposure to winter cold and summer heat, the protective components of this fluid are weakened and its effectiveness can be dramatically decreased. Check and service your car's cooling system at the intervals recommended in your owner’s manual. Byfield Auto offers a Radiator Flush Service that will thoroughly flush your radiator and engine block, draining exhausted anti-freeze and replacing it with fresh clean coolant that meets the specifications found in your owner’s manual. How often should I have my A/C checked? Your air conditioner will not operate as efficiently when air and moisture make their way into the system. An annual inspection of the air conditioning system will ensure peak performance and may help prevent costly repairs. We offer an A/C service and recharge package that can help revitalize old and inefficient A/C systems. Is premium gas better for my car than regular or mid-grade gas? Automotive experts say that only a small percentage of vehicles sold in the U.S. require premium gasoline. For most vehicles premium gas will make little or no difference in terms of how well they perform. Follow the recommended octane requirement from the manufacturer and your vehicle will run properly. What happens if my tires aren't inflated to the proper pressure? Tires that are under or over inflated can cause uneven tread wear, reduce the life of the tire, reduce traction, and impact gas mileage, reducing your fuel economy. That’s why you should check your tire pressure at least once a month and adjust to the recommended pressure listed in your owner's manual. You can also find this information on a sticker in the trunk, on the door pillar, in the glove box, or on your fuel door. We often offer some kind of special each month, so please check back often to see where you can save some money on the care of your car this month. Byfield Auto can be found along the quiet and picturesque Orchard Street just a few minutes drive from either I-95 or Route 1.
or type in a specific address to get detailed driving directions.